Introduce your students to the latest that Microsoft Office has to offer with the new generation of Shelly Cashman Series books! For the past three decades, the Shelly Cashman Series has effectively introduced computer skills to millions of students. 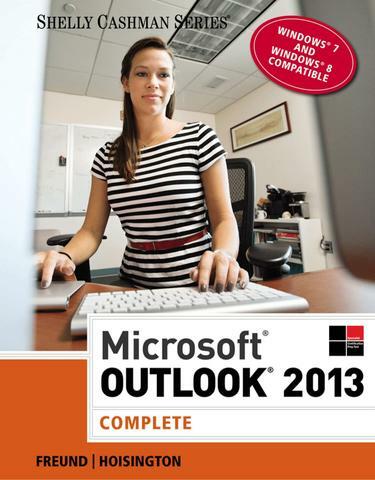 With MICROSOFT OUTLOOK 2013, we're continuing our history of innovation by enhancing our proven pedagogy to reflect the learning styles of today's students. In this text you'll find features that are specifically designed to engage students, improve retention, and prepare them for future success. Our trademark step-by-step, screen-by-screen approach now encourages students to expand their understanding of MICROSOFT OUTLOOK 2013 through experimentation, critical thought, and personalization. With these enhancements and more, the Shelly Cashman Series continues to deliver the most effective educational materials for you and your students.